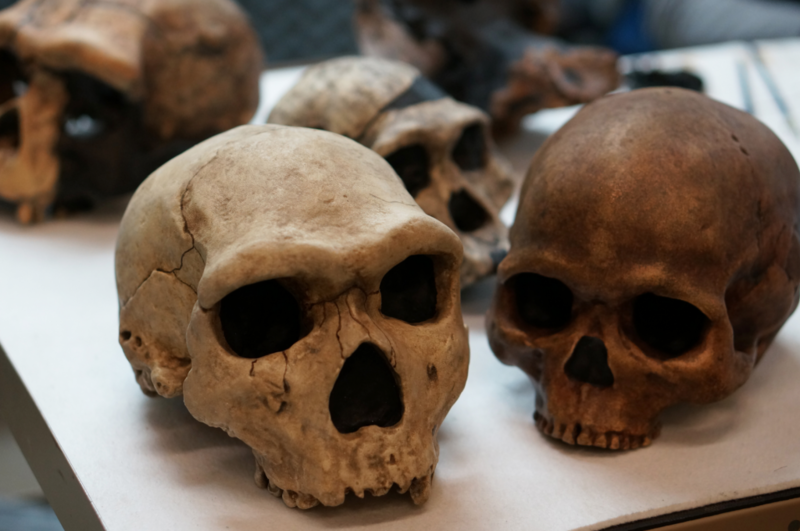 At OEC we’re particularly excited about the traveling Exploring Human Origins exhibition. To get this show on the road, our model shop had the remarkable task of making 95 skulls. Additionally, the model shop oversaw the creation of five nylon skulls that were printed off-site from OEC files, and then painted at OEC. Five nylon skulls are used in interactives in the Exploring Human Origins exhibit. The nylon skulls were painted with automotive paint to withstand the stresses of being handled by visitors. In addition to the five skulls used in the exhibition, each of the nineteen hosting libraries will receive copies of the five skulls. 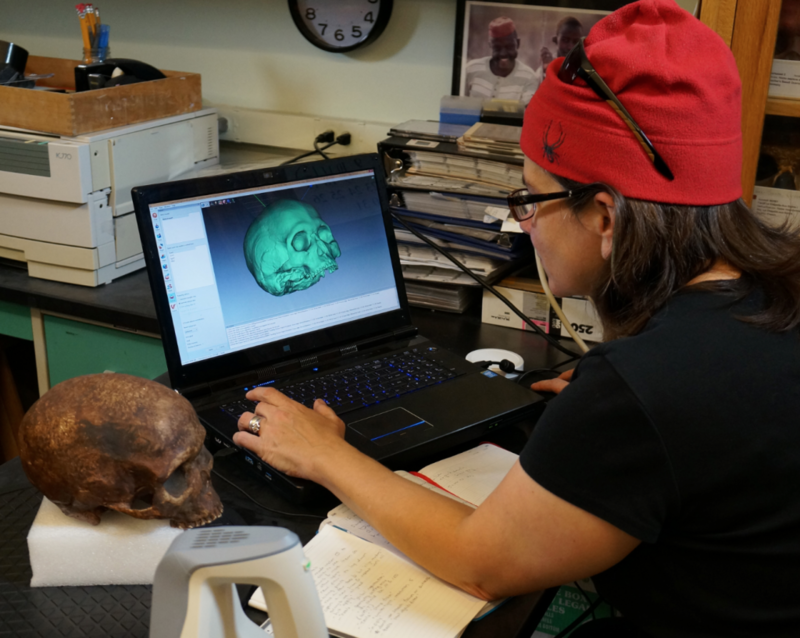 OEC is printing those skulls in-house. The obvious question is: how do you go about making a few dozen skulls? OEC’s Carolyn Thome, Megan Dattoria, and Erin Mahoney were willing to explain. It all starts with a scan – and then more scans. Scanning is how the model makers gather their data – the density, cracks, seams, ridges – any and all details that need to be copied. A scanner records the details of a cast of the Fish Hoek skull. 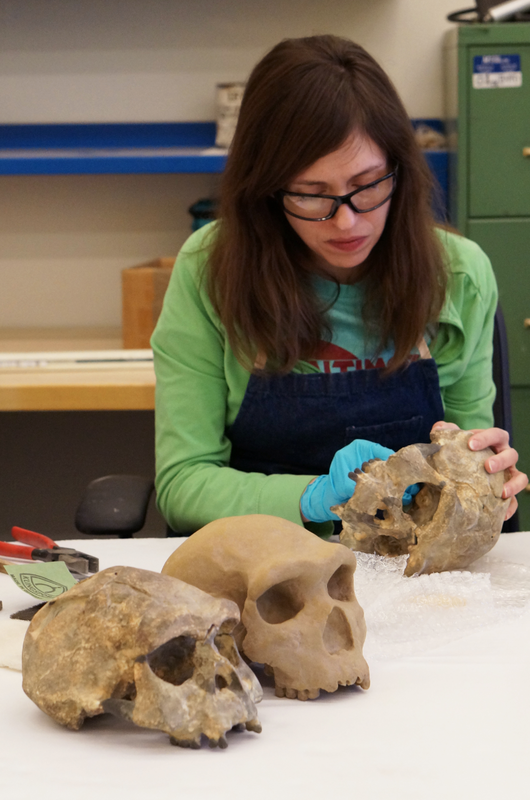 All of the skulls scanned are from the Human Origins Program research collection. Once the data is collected, it’s processed to create a file. That file is used to 3D print the skull. 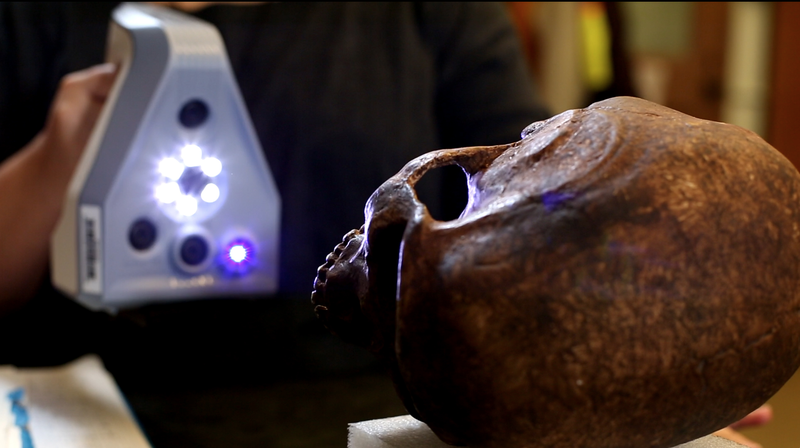 Carolyn Thome uses the Artec scanner software to process the file for 3D printing. The Fish Hoek skull keeps her company. The skull is printed out of gypsum powder. Depending on the final size of the 3D replica, it could be printed in several pieces and assembled later. Two of the skulls, fresh off the printer, await their next step towards being exhibit-ready. Gypsum powder is messy, and the completed prints need to be cleaned. Model makers use a vacuum to remove the residue from the skull. Freshly printed skulls (or 3D printed anything for that matter) are very fragile. Infiltrating them with an epoxy makes them more durable. After infiltration, the skull needs 24 hours to dry. The epoxy soaks into the gypsum powder, creating a much more durable object. 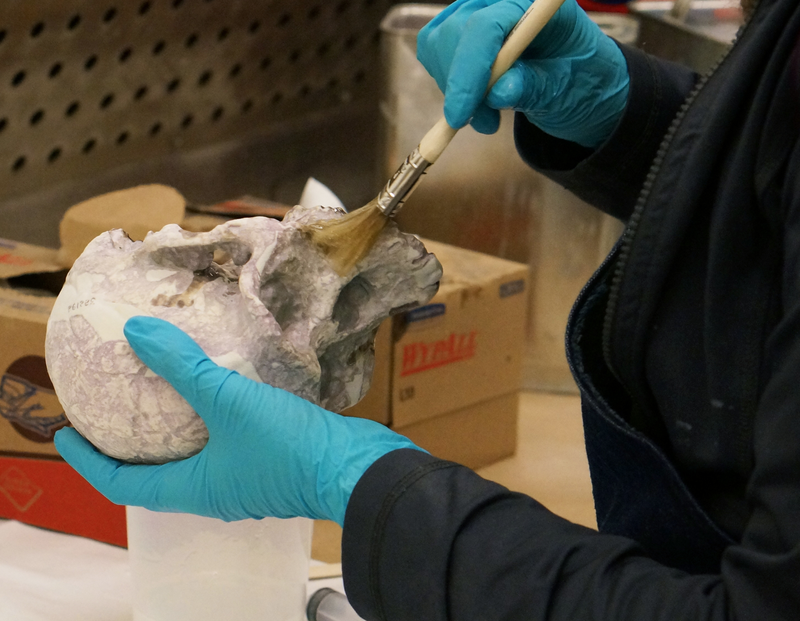 Each printed skull needs to be sanded by hand to remove build lines. Build lines are the thin layers that accumulate as the gypsum powder forms the replica. Erin Mahoney sands the underside of a printed skull. 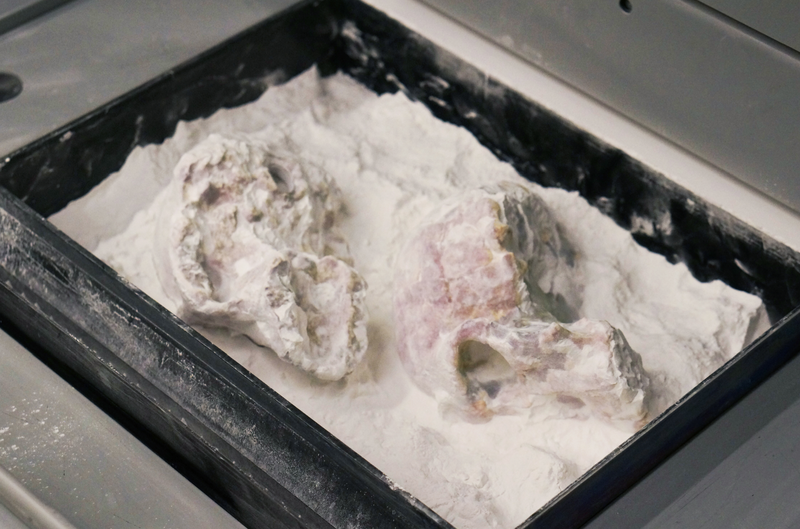 The skulls come out of the printer the color of the gypsum powder. While that’s still amazing – these are 3D printed skulls after all – it’s a bit like looking at a black and white copy of a color photo. The skulls have to be hand-painted to truly look like the original. 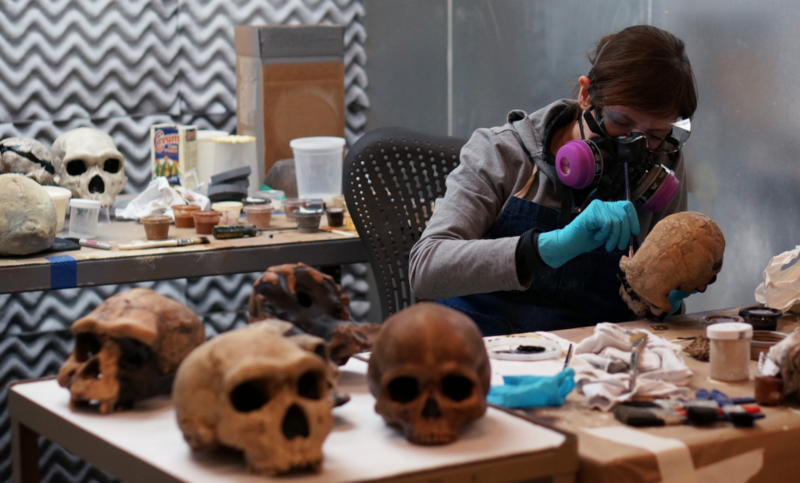 After sanding off the build lines, Erin paints the skull. 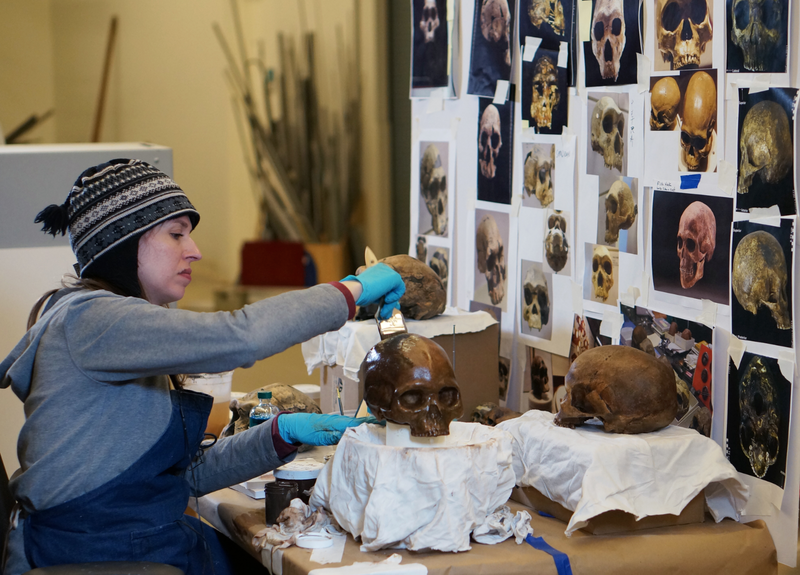 She uses multiple images of the originals as a guide as she creates the mottled appearance of old bones. The final product then gets a clear coat of automotive sealer to protect the paint. After applying the clear coat, the skull needs 12 hours to dry. A complete set of five skulls awaits shipping to a host library.